Preheat a griddle or fry pan to just above medium heat. In a medium bowl, combine all ingredients except bread and butter. Mix until the cornstarch is dissolved. Transfer mixture to a shallow bowl or pan. Dip both sides of each bread slice into the mixture. Melt butter on the griddle or skillet. Place bread on heated surface and cook each side to a light golden brown. Note: Depending on the size and thickness of your bread, you may be able to make 1 or 2 more slices of French toast with the amount of milk mixture this makes. You won't even miss the egg. It looks and tastes like regular French toast. Give it a try. 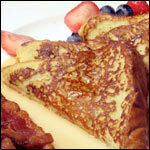 What do you think of Egg-Free French Toast? View all 55 comments for this recipe. The recipe was great and clear, but unfortunately I think I did something wrong cause they didn't taste that good. Thank you though! 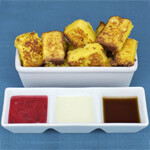 I am lacto vegetarian and never had eggs in my life but always wanted to try French toast, thank you! 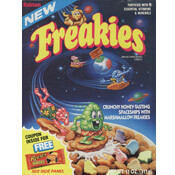 It tasted amazing. Worked brilliantly! I tried cooking in butter and with spray oil - both worked fine. Topped with maple syrup and strawberries! Didn't have eggs and kiddos were requesting French toast. Came across this recipe and gave it a try. Loved it! 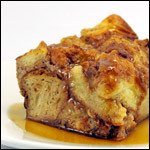 This is the best French toast! We didn't miss the eggs at all! I didn't have vanilla and I added cinnamon. It was a hit with my kids! Will definitely make it again! I developed an allergy to eggs and I have not had French toast in 15 years. 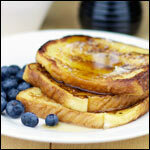 This recipe is exactly how I remember French toast tasting! 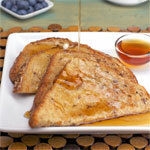 And now once a month on Sunday, my husband and I have a great French toast breakfast... Thank you! Excellent! I really suggest using cooking spray, because it will prevent it from sticking to the pan. Nice recipe! We all enjoyed it very much. This is extremely delicious! I added cinnamon. Didn't have cornstarch. Didn't need it. Still very good. 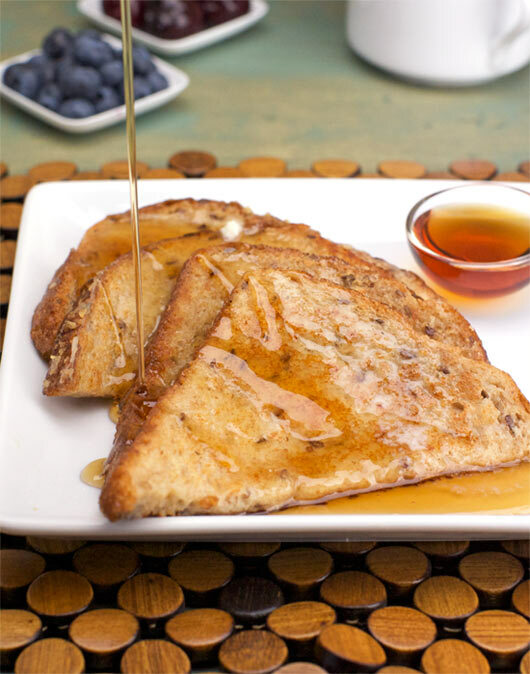 For someone who doesn't like eggs but loves French toast, this recipe is perfect! You have to move fast with dipping but it tastes awesome! We really liked this recipe! I dunked the first piece in the batter for too long. You have to work faster than an egg batter. We will make this again. Tried twice and the second time I was careful to barely dip bread in to the mixture. It stuck to my heated, buttered skillet. Bummed because I told daughter I would make it. We were out of eggs and I thought this recipe would save me going to Kroger's. The problem was probably that my bread was too thick. My son has an egg allergy and never had French toast. He loved it! I tried cooking this recipe TWICE on two different skillets but both times, the bread would crumble and burn my pan. I did not enjoy making these. 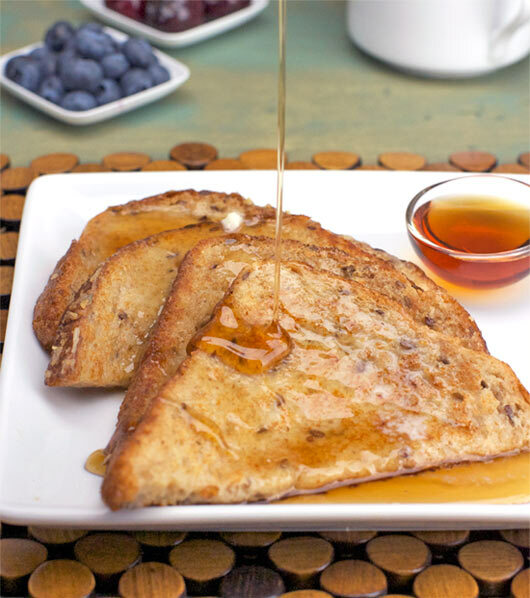 This was the best recipe for egg-free french toast! It's good, but every time I cook it the middles are kind of mushy. The outsides are perfectly fine. I don't soak it. I just dip it to coat both sides. Advice? Could not tell that eggs were missing. I had no cornstarch so I used flour instead (1:3 ratio). Thank you for this recipe! Can I make it without cornstarch?